Savannah might be a year-round vacation destination that offers something for everyone, but you shouldn't listen to folks who say it doesn't matter where you stay. 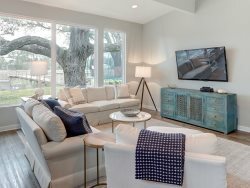 The location and amenities at Savannah vacation rentals can make or break a trip to Georgia's coastal gem, and it's critical that you choose a place that speaks to you and your family. At Pickett's Place, you'll find everything you could ask for in a temporary home base - and then some. Located just blocks from the heart of Savannah downtown, Pickett's Place offers an unmatched mix of convenience, creature comforts and historic charm. This beautiful townhouse is tucked into a quiet corner at the intersection of Jones and Tattnall Streets. It's just blocks from lush, centuries-old Chatham and Pulaski Squares, resplendent outdoor spaces in which meandering tourists often come face-to-face with wedding parties, historical reenactments and performance artists. What's more, Pickett's Place is close to some of Savannah's finest cultural and culinary establishments. When you're this close to the center of the Savannah GA Historic District, anything seems possible. The bustling, cobbled streets and sidewalks of Savannah downtown truly offer something for everyone. If you're looking for a cultural experience to rival anything you'd find in Atlanta or New York, visit the art exhibits at the nearby Telfair Museum or Jepson Art Gallery. For a more contemporary take on visual art, the Julia Christian Gallery and the Savannah College of Art and Design's galleries sit within easy walking distance. To discover pieces of colonial history that you may have thought were lost to the mists of time forever, visit the Davenport House Museum, Georgia Historical Society or Georgia Railroad Museum. If you wouldn't pass up a shopping opportunity for the world, never fear: The world-renowned shops and stores of Broughton Street aren't far off. Pickett's Place has a range of amenities that you simply won't find at other Savannah vacation rentals. When you enter the home, you'll be greeted by a spacious living area with a sectional that comfortably seats six guests as well as sleek, modern seating for several more. A flatscreen TV is sure to keep the kids entertained, and a downstairs half-bath will please your guests. If you're in the mood to stay in and spend some quality time with the family, check out a stunning kitchen that features a breakfast bar, gleaming appliances and plenty of counter space for the budding gourmet in you. With 2.5 bathrooms and three bedrooms, Pickett's Place is quite roomy by Savannah GA Historic District standards. The two second-floor bedrooms have ensuite bathrooms with recently updated appliances and lots of space for pampering. A loft-style bedroom on the third floor offers privacy for older kids, and a private patio area in the back lets you listen to the sounds of central Savannah without revealing yourself to the public. Aside from these incomparable touches and modern bits of flair, Pickett's Place has all the conveniences you'd expect from your primary home. Whether it's central heating and cooling to get you through Savannah's unpredictable nights, a powerful washer-dryer that eliminates the need to find a laundromat or full-house wifi that ensures you remain connected to those who couldn't be with you on your trip, this property leaves other Savannah vacation rentals in the dust. Whether you're in town for a quick weekend getaway or wish to relax with the whole family for an unforgettable week, Pickett's Place gives you the freedom to structure your Savannah vacation as you see fit. With an enviable location, beautiful furnishings and every amenity a pampered homeowner could want, you'll have trouble leaving this incomparable property. To begin your adventure in the heart of the Savannah GA Historic District, book your stay at Pickett's Place today. The team was very accommodating and let us store our luggage in the office between check out and our later afternoon flight. It was a huge help and much appreciated! Southern Belle was friendly and accommodating. -- the staff helped us out on suggestions and storing our luggage. We were extremely happy with all aspects especially the early and late check out. Everyone was friendly and very helpful. On the early afternoon of the day after check-in, I got a call to make sure everything was ok and we were happy. That was very nice and has never happened with any other company we have used. We enjoyed our stay. We had plenty of room and hot water. The home was lovely! Bedding was very comfy and cozy. Always love coming to Savannah and we have stayed in several Southern Belle rentals. We will be back! Team members were always very easy to contact and very thorough and knowledgeable in helping answer any questions my family members and I had. Excellent, quaint, clean, well decorated & comfortable property in a very convenient and great location of Savannah. Walking distance to everything you want to see and great coffee shop (Savannah Roasters) within 3 blocks. Quiet and safe! I received a phone call on Saturday from an employee at Southern Belle just to make sure we were enjoying our stay. True Southern hospitality! The check in and check out process were so simple which alleviates so much stress when you are visiting another city! It was extremely convenient that Picketts Place was down the street from Southern Belle. I loved that everything we needed to create meals in the kitchen was available, and also loved that the property had an outdoor patio area. Huge bonus for the property to provide linens and towels as well! It was very nice and clean. Excellent location with a great restaurant just out the back door. Excellent for a girls trip. It was lovely We had a great time and we would rent from you guy's again. For sure. location was great, no complaints at all. Everyone I spoke with was polite, professional, knowledgeable and courteous. The information they provided was not only accurate, but definitely appreciated. Pickett's Place was just what we hoped it would be. We originally anticipated 6 girls, but two cancelled and so we were just 4. We thought this was perfect since it afforded two women their own rooms. I'd still stay with 6, but four was well, a little more roomy in general. Everyone was easy to work with. Clean and well equipped. Convenient location in a beautiful neighborhood. Loved two bedrooms with private baths. . Great job Southern Belle. Southern Belle is a pleasure to deal with - the entire process is made so easy! Pickett's Place is an excellent vacation rental - great location, plenty of space, clean, lots of amenities - has all you need for your home-away-from home! Very easy to work with. No problems. Enjoyed our stay! Place was very clean, comfortable and close to everything we wanted to do.